In 2017, Google reported that 20 percent of searches on its mobile app and Android devices are done by voice. ComScore predicts that more than 50 percent of searches will be voice-based by 2020. This number is growing exponentially each year and clearly indicates that voice-based searches will be dominating in the future. Voice-first Interaction refers to a system which primarily accepts user input via voice commands, and may produce the audio output. Voice-First is a tech innovation that will transform way millions of users interact with devices or applications. It will change the way we discover and consume contents. The world moves fast, everybody is super busy and want to do things quickly. This is where Voice-First plays a major role, which allows us to keep our hand free and multitasks. Voice offers a faster and easier way to communicate and do things. Now, Amazon Alexa and Google Assistant are two major players in voice space. Both of them have their own voice-enabled smart speakers which allow us to communicate with the service. Amazon Alexa can access through the Echo device - Echo Dot, Echo Plus, Echo Show etc. Google Assistant can access through the Google Home devices. Amazon Alexa voice assistant has over 40,000 skills. Amazon encourages other companies to integrate the Alexa services into their devices. Today, Alexa is appearing in everything from lamps, watches, headphones, switches etc. You might find Amazon Alexa in offices, bedrooms, Kitchens, and even in Bathrooms. These intelligent assistants will become an important part of our daily life, and soon they will be part of our everyday habits. For a brand, this is the right time to think about the Voice-First strategy. 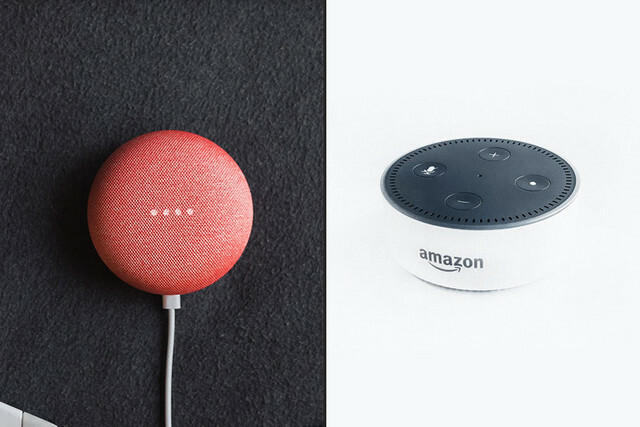 Voice-First is going to be an important part of any brand's business strategy. It gives the brands the ability to have a conversation with your customers from around the world. It's important for brands to understand what these new trends mean for their business. Brands need to spend time around voice strategy to figure out what works best for them and implement it. Voice is going to disrupt the traditional advertising, marketing, e-commerce. In the U.S, nearly one in five adults today have access to a smart speaker, according to research from Voicebot.ai. That means around 47.3 million U.S. adults have access to a smart speaker. Don't be too late, the market is already crowded. Amazon Alexa has now more than 40,000 skills. Here is the best example of how brands can offer values through voice experience. Zyrtec Zyrtec is an allergy medicine brand. The skill help allergy sufferers evaluate weather, pollen count, and prominent allergens in their area before they leave the house. The skill provides personal Allergy Impact Score that tells users how the day’s allergens might make them feel. The brand encourages users to pick up a bottle of allergy meds on certain days. The Tide This skill talks you through how to remove a stain from an item of clothing. For example, it can tell you how to get spaghetti stains out. Now, brands and merchants can sell physical goods and services through their Alexa skills. This offers an alternative channel for the merchants to sell their products and a new way to generate more revenue. The payment is handled by Amazon Pay for Alexa Skills. Merchants can sell physical goods such as food, clothing, flowers, electronics, print magazine subscriptions, and more or services such as hotel reservations, gym memberships, event tickets, transportation, delivery, and more. Brands which produce contents for their customers can think of an alternative approach for the monetizing their Alexa Skills. If the customers like the contents, brands can offer premium content through their Alexa Skills. For example, fitness brands can charge for an additional premium content to go along with their daily fitness-related tips. Brands that do not adapt to voice first strategy will fall behind on their competitor in 2020 as more and more customers start to use voice assistants.